Once every two years from June to November, Venice becomes the centre of the contemporary art world, when it is hosting one of the most prestigious international art gathering: the Biennale. Initially a competition between Nation States, it has developed into a multi-cultural event dedicated to contemporary art, ie visual arts from the 1960s/70s to today, including official presentations as well as more alternative shows throughout the city. As part of the event, the participating countries select one of their artists to represent them in their national pavilion located in the Giardini district of Venice, while at the same time a cross-border international exhibition is organised by the chosen curator for each Biennale. The countries who joined more recently have an exhibition space in the nearby Arsenale, which developed as a space as the Biennale needed to expand from its original setting in the Giardini. This year, the Biennale Golden Lion for best national participation was awarded to Germany with the work of Christof Schlingensief, A church of fear vs the Alien Within. In the pavilion, the artist recreated the church where he served as an altar boy, which he used as a setting for a number of simultaneous film projections, visual art displays and music. Schlingensief had just enough time to design the pavilion but never saw his complete work as he died from lung cancer in 2010, almost a year before the opening. I entered the pavilion without knowing anything about him and his personal story, and was immediately pulled in. The church setting was impressive and the artistic content powerful. Of course, it seems even more meaningful now that I know that it was about his personal struggle with cancer. 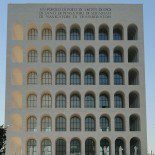 Living in Rome, we are quite isolated from the contemporary art scene in spite of the new MAXXI museum, and would therefore not be as exposed to it as in London, New York, Berlin or even Paris. So visiting the Venice Biennale is a good way to catch up with what’s going on in the 21st century art world. It is also a nice opportunity to enjoy Venice and see new art in prestigious settings such as old palaces and other landmarks of the city. I’m planning to make it a regular trip every two years! This entry was posted on June 12, 2011 by Salambo in Arts and culture, Travel outside Rome and tagged biennale, contemporary art, italy, Rome, venice.